Lapland is a vast region. Stretching out from the western border with Sweden to the northern border with Norway and to the eastern border with Russia, Lapland is the largest region in Finland. 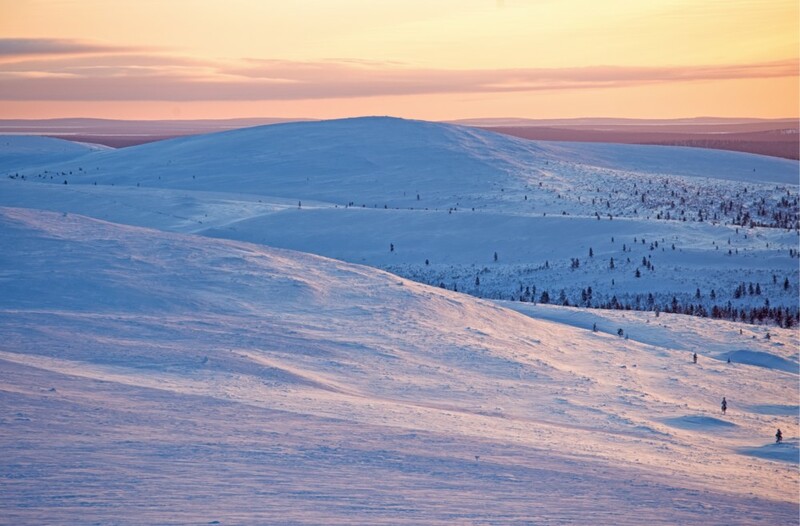 Lapland has a total area of over 100,000 square kilometres. Lapland is full of rivers and lakes, with Lake Inarijärvi being the largest and deepest covering over 1,100 square kilometres. From tall fells to lakes and swamp areas, Lapland’s wildlife is extremely diverse and rich, as indeed are its seasons, from polar night of winter when sun doesn’t rise above the horizon, to midnight sunshine in the summer making it a truly special travel destination. The snowy fell highlands, Northern Lights, frozen lakes and snow-clad forests are in perfect contrast with the vibrant shades of autumn, with blue crystal-clear waters flowing through the blossoming summer nature. Despite covering such a large area, Lapland has a population of only around 180,000 inhabitants, making it the most sparsely populated region in Finland. However, there are many bustling towns and resorts with all the comfortable amenities, guided activities and recreational facilities right next to the wilderness, making it easy to travel in Lapland and enjoy unique experiences. Inari Municipality and the quaint fell highland resort of Saariselkä are located in Finnish Lapland, next to the Norwegian and Russian borders. Inari Municipality houses a number of villages, with Ivalo being the largest commercial and administrative hub in northern Lapland that also boasts the northernmost airport in the European Union. Ivalo has hotels, a wide range of services and accommodation too, and it is a hassle-free place to do some shopping. Most of the local inhabitants live around Ivalo. Heading north from Ivalo, you will find the lovely village of Inari (the village carries the same name as the municipality) welcoming visitors to Sámi Museum and Nature Centre Siida, Sámi Cultural Centre Sajos, numerous hotels and activities. The village is set on the shores of Lake Inarijärvi. There are plenty of other smaller Lappish villages well worth experiencing, such as Nellim, Menesjärvi, Lemmenjoki close to Lemmenjoki National Park, and Sevettijärvi. Saariselkä is a quaint fell highland resort located in Inari Municipality. Saariselkä boasts a wide range of activities and is the northernmost holiday resort in the Europe. The resort is located about 250 kilometres north of the Arctic Circle. Sitting right next to the Urho Kekkonen National Park, Saariselkä is the perfect destination for experiencing the wilderness combined with comfortable accommodation and excellent services. 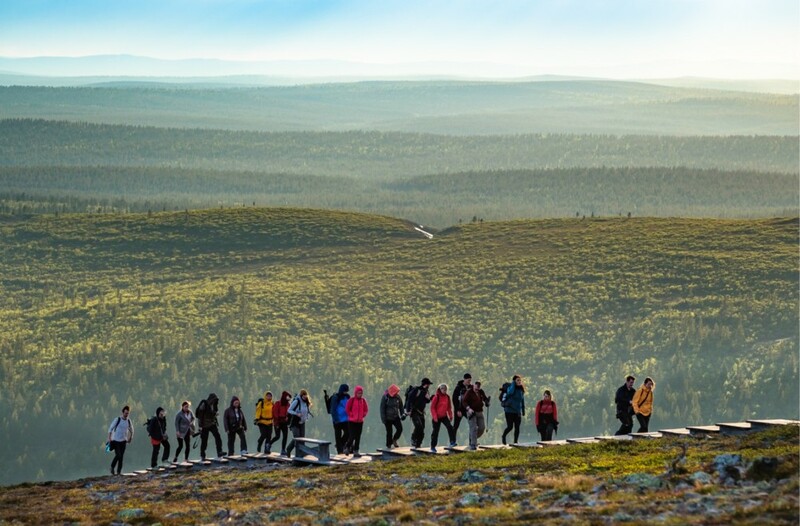 During the summer season, you can venture on a hike along the well-marked hiking routes of the Urho Kekkonen National Park. There are also many possibilities for mountain biking. Saariselkä also has an 18-hole disc golf (also known as frisbee golf) course. In wintertime, the resort maintains around 200 kilometres of cross-country skiing tracks. For downhill skiers, there are altogether 15 slopes spanning two entire fells. There are also many great opportunities for friends and families to enjoy quality time together, as there’s a tobogganing run covering a distance of 1800 metres, ski schools, spa, bowling, and much more. Saariselkä Customer Service Point Kiehinen Kelotie 1 / Siula, FI-99830 Saariselkä | Tel. +358 40 168 7838 | tourist.info@saariselka.fi Open daily 10 a.m. – 5 p.m.
Ivalo Customer Service Point Ivalontie 10, FI-99800 Ivalo | Tel. +358 40 168 9668 | tourist.info@inari.fi | Open: weekdays 9 a.m. – 4 p.m.
Inari-Saariselkä is easy to reach. Ivalo Airport is only 25 kilometres from Saariselkä, 7 kilometres from the village of Ivalo, the region’s administrative and commercial hub, and 40 kilometres from Inari village. Daily flights are available from Helsinki to Ivalo (Finnair, Norwegian in winter). There are also direct flights to the UK, Germany and France during the winter season, in addition to charter flights. When arriving at the destination, there are bus services and taxis available, or you might have your hotel or accommodation representative greet you at the airport. You can also reserve a hire car to pick up on arrival. Leaving Ivalo Airport: Buses, hire cars and taxis are at your service at Ivalo Airport. There are scheduled airport transfers to Inari and Saariselkä-Kiilopää. IVALO AIRPORT – SAARISELKÄ AND KIILOPÄÄ Regular connections to and from each scheduled flight. If you want to experience Finland by train, you can travel from Helsinki to Rovaniemi. From Rovaniemi, you can either take a bus or hire a car to get to the Inari-Saariselkä region.